This past Wednesday, Nipsey Hussle was nominated for a Grammy and celebrity friends – JAY-Z, Snoop Dogg, T.I., Dave Chappelle, and Tiffany Haddish – came out to celebrate with him! With DJ Trauma spinning, the A-list group toasted with signature cocktails made with CÎROC and DeLeón Tequila at L.A. hotspot The Peppermint Club. Puma sponsored the special event, as the guest of honor recently became a brand ambassador for the iconic shoe/apparel company last spring. Our team had only 24 hours to “hustle” and make the festivities a memorable occasion. A towering photograph showcasing the rapper wearing Puma apparel was “framed” in long garlands of florals, including fresh white orchids and roses. It was the ideal photo op, which guests enjoyed! Pairs of Puma x Nipsey Hussle custom black tennis shoes – boasting gold laces and other bullion details – were placed on beds of flowers, making the presentation both edgy and chic. Additional pairs of shoes inspired by the rapper were also on display and placed on metallic pedestals. 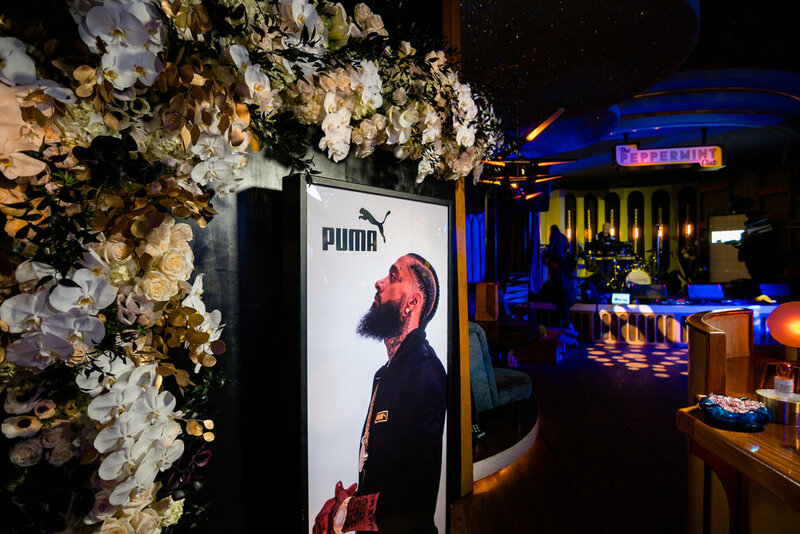 Puma x Nipsey Hussle artwork was seen throughout the space, as well as a masculine custom lighting design and vinyl decals to continue the theme throughout the venue. Additional gilt votive candles were sprinkled throughout, alongside Puma shoeboxes with vanilla roses and gold-sprayed greenery spilling out. The joyful sentiments were authentic and you could visually see how delighted they were to be out together celebrating their talented friend. You know, between working and family, you sometimes feel too busy to make it to a night out with friends, but once you do, you’re so glad you did? That’s what it felt like. The ambience was pleasant, upbeat, and super lively. Especially once Nipsey hit the stage to perform some songs from the Victory Lap album.